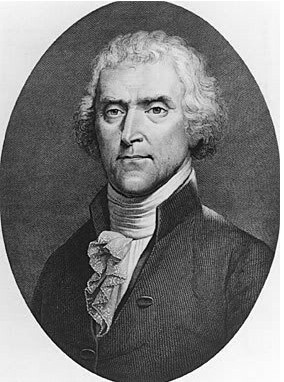 Thomas Jefferson knew what he was saying when he said: "Never put off for tomorrow what you can do today". How many times have you said:"I'll do that tomorrow" or 'Next week', even 'Next month'...? We take it for granted that Aunt Jill will be alive when we finally make time to visit; we operate on the premise that we will be able to do whatever it is we're planning whenever it is we're planning it for... however, we forget that we are not in control - just ask those passengers stranded due to the Icelandic ash saga. We walk around believing we are Masters of Our Fate and Authors of Our Destinies, strutting and swaggering like we're all that. And sometimes we are - but many times we're not. For a significant part of the time we're here on earth, we're all just playing the hand we've been dealt as best we can - while waiting for a better hand or a weaker opponent. There are no coincidences. The M. Night Shamalayan movie 'Signs' used an alien invasion to drive home this point. The bible phrases it more along the lines of 'all things working together...' stay with me now. My mother was with us in England this last xmas. At a loss as to what to get her this time, HRH decided to pander to her shopaholicism and give her gift vouchers for one of her favourite department stores. I thought it was a cop out but she was rather pleased. Imagine my surprise when a couple of weeks later she hit the January sales and bought baby clothes not only for my son but for our then unborn child as well. If I remember correctly I actually told her off for 'wasting her money' on us when she was supposed to treat herself. Mother being mother - ignored me (as usual) and did what pleased her most. I sorted out the Young Prince's new clothes but I packed away the gift for the unborn. During my last labour I relied heavily on hypnobirthing and spent the majority of my time in a birthing pool. I was incredibly relaxed and chilled until exhaustion and foetal distress (he was stuck) led to the delivery of the Young Prince by emergency c-section after 23 hours of hard slog. My intention was to employ these same pain relief methods this time around as they had just a calming and centring effect on me (it was as though I was unconscious between contractions - pure bliss!) However, I could not find the birthing scripts or CD and by the time I did dig them up it was too late for them to be effective. I was quite upset by this as I dreaded the thought of labouring without these aids. Furthermore, HRH insisted that he would not be blowing the pool up manually this time around and promised to order an electric pump but week after week went by with him responding "not yet" to my question "have you ordered the pump yet?" Having not long returned to work after my previous maternity leave, I was incredibly concious of 'appearances' and the sway of the office grapevine, so my plan was to work for as long as possible. I scheduled my maternity leave to begin the weekend before my due date - after all, the Prince came right on time: why should this one be any different? HRH vehemently disagreed with this and suggested I start my leave 6 weeks prior - especially since I was so ill (remember the hyperemesis gravidarum?) and was finding it increasingly difficult to travel into the office. It wasn't until a fellow passenger jumped onto my bump while squeezing into the tube during rush hour one morning that I realised I needed to pack it in for the sake of our unborn. I negotiated with my managers and agreed to start mat leave 4 weeks before my due date. Unfortunately, problems with paperwork going missing in the post meant that I was still working as I approached 36 weeks, making it unlikely that I could take leave before 37/38 weeks. I was on the books to have a Home Birth; however the Chief Obstetrician at the local hospital had his reservations (due to the fact that I'd had a c-section not so long ago). It took a colossal effort, loads of research and canvassing (on my part) to persuade him and his team to allow me to proceed with my home birth. I needed one final signature on the paperwork and a plan of care from the Head Midwife - an appointment was scheduled for Friday 26th March. A year (or so) earlier, one of my old College buddies and his wife moved into our 'neighbourhood'; the Watermans had previously lived (a zillion miles away) in Chichester. With them nearby I was better able to reach out and eventually became good friends with his wife. I am always the last person to pack for and unpack after a trip; whereas HRH will have everything back in its place within 30 mins of returning home - I'm the one with the backpack in the corner with everything still in it except the dirty laundry. On the 24th March I lumbered into the office as usual and faxed through a copy of the missing paperwork to HR. We agreed that maternity leave could begin from 1 April. I came home and checked my list (of things I would need should I go into hospital and things I would need for a home birth). I planned to sort it all out on Saturday when I would know one way or another if I was definitely OK to have the home birth or whether I would need a scheduled c-section. My sister-in-law is training to be a nurse and was on placement instead of at university. Her uniform and stethoscope would come in handy. Cherie Waterman was not at College and her husband was enjoying a day off and therefore available to babysit their child - also very handy. HRH had a meeting in Canary Wharf which brought him much closer to where we live than he would have been had he been travelling back from Croydon. My niece had travelled down from university so I could retighten her locks - this would prove to be super handy. I had the most uncomfortable night I'd had in ages. The Young Prince had picked up a bug from nursery and would be unable to go in, luckily my niece was around and could look after him while I worked from home. By 8 am I was logged on... but I was also feeling some pain. Since this was too early, I assumed it was false labour and carried on with work. The pain got worse. I joined my 10 am conference call but had to place myself on mute because the pains were becoming overwhelming. I explained to my manager (via prvt msg on a chat program) and logged off with a promise to keep her uptodate. I thought I had simply been working too hard and would feel better after a lie down but it was not to be. I looked at my dates and felt a rising panic. "It's too early" I kept saying. By midday I was definitely in labour, I couldn't focus enough to use any hypnobirthing techniques, so it was down to controlled breathing and talking myself down from fear and panic. I called my midwife but she couldn't come out to deliver because I didn't have the final sign offs required - she advised that I go to hospital. Those of you who know me well know how mortified I was by this - especially since I would have to go to the nearest hospital which was the very one I had been trying to avoid. Cherie & Brenda (sis-in-law) had arrived by then. Cherie kept insisting we 'leave NOW' - but I knew what that hospital was like and I was NOT going there any earlier than I had to. No way was I going there to wait for hours in misery and discomfort when I could stay in my own home and feel safe. Besides - I hadn't packed anything or got anything for the baby etc. We went into military mode - these women were my left and right hands - they deserve medals. Being mothers themselves they knew what to look for and what to ask for when it came to packing the hospital bag. Thank God that I had left my backpack in the corner, all the toiletries were ready, they just added clothing. We found muslin cloths in a drawer and an unopened pack of Newborn disposable diapers under the Prince's cot (There are no coincidences. I never got around to giving them away!) . It was then I realised I had nothing for the baby to wear! "It's too early - I'm not ready!" I cried in tears... but the lieutenants went on the hunt. Surely there might be something of the Prince's still around - unfortunately, I had given most of the newborn stuff away! Somewhere, somehow, Cherie found that unopened gift my mother had bought 3 months earlier: 3 newborn baby sleep suits. She ripped them out and Laurelle (my niece) threw them in the washing machine. I told them to wash them because we couldn't put unwashed stuff on the baby AND we weren't leaving until they were done (that means washed AND dried). Sometime after 2 p.m we left the house and headed to the hospital. We had just about everything I needed. I'll save the delivery room drama and cockups for some other time - it's taken me long enough to write this one (and this is turning out to be loooooooooooooong as it is!). Short story is - the little one was not getting enough oxygen, originally they thought this could have been failure on the part of the placenta but in hindsight (after the stint in NICU) it was due to the fact her red blood cells were compromised (being destroyed by antibodies). Approximately, 2 hours after arriving at the hospital, our little girl entered the world. Like most people I know, I assumed that I'd have the baby and be home the next day, 48 hours max - but again this was not to be. 7 days passed before we were able to take her home. It may not seem like very long to you, but for a newborn baby & their parents it is an eternity. Take nothing for granted - because "nothing's ever promised tomorrow today", what you think will happen just might not. Life can be A LOT sometimes ... but in all things we give thanks, I guess the purpose is for (you) us to tell the story for the sake of others. 'Knowing' (you) or anyone is'nt and never should be a pre-requisite for prayer. Good heavens!! I had no idea this much drama was happening. Thank God all is well. Your baby is beautiful. BTW, I like your new look. Thanks Anthia-ofo, I think I felt compelled to put on a brave face and keep up appearances while it was all falling apart, it's only now that I feel strong enough to talk about it! @Njoi - Thanks again man. You are an inspiration and yes, give God the glory. Nothing is ever a coincidence. Yes, God is awesome...and I know that only too well. The wonderful thing about letting go is that it gives us perspective on life (remember the bit about how He cares for the sparrow as insignificant as it might seem etc), how much more will He look afte rus if we trust Him...of course that is not always easy when we are going through storms of life... and often I do believe, that when we reflect we will see the bigger picture e.g. what did we learn from/through the experience? From your writing, you sure learned a lot!!! Hope your little ones are fine and soaking up the sunshine LOL!!! Like you said girlie NOTHING IS COINCIDENCE and I known for sure if the enemy fought her debut THAT hard... Oh the possibilities for baby girl! I am excited about her life. That is a warrior, teach her early the things of God. She is no ordinary little girl. We bless God for her life. Yep God IS good. He always guides us where we should go... WE just have to listen. Hey sis! I still can't get over how it turned out that the only clothes she ended up having ready were clothes that Mum bought for her on a whim! Wow! so many little things that all worked together! LOL! Its funny (literally) how we read in the Word all the time, and hear about how God is omniscient, omnipotent and omnipresent.. and then when He does something like this we're utterly amazed at the "coincidences".. He must be up there going "Well... DUH!" LOL!